Ford’s improved 2015 F-150 is lighter and stronger than ever. Shedding weight and replacing heavy bits with aluminum has its advantages — and for those who tow, the news couldn’t be better. The 2015 pickup will handle an impressive 12,200 pounds of towing capacity, paired to 3,300 pounds of payload for those hauling stuff in the bed. These figures are for the 3.5L twin-turbo EcoBoost and RWD. These numbers are pretty impressive considering the 2nd-best is the burly 6.2L, V8-powered 2015 Ram 1500 with 12,000 towing capacity (and that’s equipped with the optional trailering package). An 8-inch LCD with driver info also provides towing tips — definitely a handy feature. The Auto Start-Stop is handy shutting off the engine to save fuel, but keep in mind this function doesn’t work when towing in four-wheel drive mode. As for power, expect the 3.5L EcoBoost to make 365-hp and 420 lb.ft of torque, with the burlier 5.0L V8 to put down not much more at 385-hp and 387 lb.ft of torque. Quebec City, QC – If you’re from Alberta as I am, you’re familiar with pickup trucks where its practically a prerequisite to own one if you plan to live here. No, seriously, every other driveway on my street is adorned with a gleaming, late model pickup from midsize to heavy-duty, from contractors and field workers who actually need them to suburban dads and khaki-wearing structural engineers who probably don’t. But I digress. Everytime I get behind the wheel of the latest pickup, with its comfortable luxury sedan-like cabin, I’m less inclined to return the keys. Owning a new truck begins to make sense, even if you’re a metrosexual doing nothing more than recycling bottles on the weekend. So the idea of driving the all-new 2015 Ford F-150 through the beautiful, rolling hills surrounding Quebec City seemed a bit out of context — they drive pickups in Quebec? Where over fifty-percent of tiny b-class cars are sold? Cars like the Nissan Micra or Ford Fiesta you’ll seldom see in the Prairies unless its sitting idle at the dealer lot or on the highway in the bed of a pickup? I joke. This Albertan is not that ignorant (what is poutine, does it have beef?). By now, you’re probably familiar with the introduction of the military grade aluminum alloys in the all-new 2015 Ford F-150; something the automaker had been secretly testing since 2009. 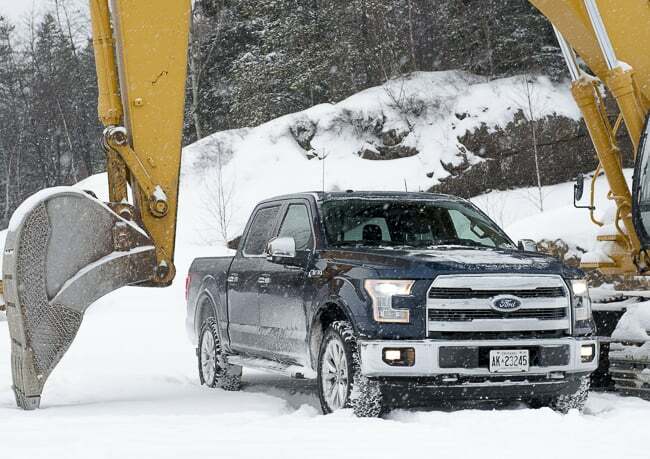 If not, you likely will be soon as the 2015 F-150 won the 2015 Canadian Truck of the Year awarded by AJAC announced just last week during a press conference at the Toronto Auto Show (CIAS). The country’s best-selling pickup truck for over fourty-years is simply getting better. And in order to stay on top, you need to innovate — something Ford has been doing well across all product-lines, and perhaps the sole reason the automaker came out relatively unscathed following the 2008 financial mess which hit Ford’s competitors hard. Build on an all-new high-strength steel frame with an aluminum alloy body and box , the 2015 F-150 sheds 700 lbs of weight, resulting in more capability and efficiency, better braking, faster acceleration, improved handling, and better payload without increasing the overall weight. In true The Biggest Loser tv show fashion, this dramatic weight reduction and incorporating the aluminum alloys is more than just hype; the impact to both the consumer and the truck segment in general will be likely be significant. Unless you’re recycling bottles on the weekend. The new F-150 sheds some trims as well simplifying consumer options from eight trim choices in 2014 down to five for 2015. So adding a chrome package, f0r instance, is less of process now — for 2015 we find a new appearance package allowing the shiney stuff across all trims. Makes sense. The 2015 models include XL, XLT, Lariat, King Ranch, and Platinum. The appearance packages include the FX4 Off-Road (4×4) across all five trims, and the Chrome Appearance package or Sport Appearance package with a Monochrome Paint option available on all but Platinum. Four engine options are available, including the all-new 2.7L EcoBoost offering best-in-class mileage and a power-to-weight ratio with a 5 -16% improvement for better overall performance. This new EcoBoost produces 325-hp with 8500 lbs. maximum towing or 2250 lbs. maximum payload; and the 375 lb.ft of torque, according to Ford, provides an 8% torque-to-weight advantage over the Chevrolet’s 5.3L V8 and 5% advantage compared to the Ram 3.0L Diesel. In other words, the smaller 2.7L displacement along with the F-150’s lightweight design provides incredibly better power-to-weight performance. But for those of us not hauling or towing stuff, or have little use for power/torque ratios, payload ratings, and the only aluminum we care about belongs in the kitchen drawer, the 2015 F-150 finds new convenience and technology features making this a much smarter, more efficient work truck as well. A new hands-free remote tailgate with an integrated and hidden tailgate step, plus deployable box-side steps are a few key features. A bright LED cargo box light now shines from the rear forward providing ample brightness and another small LED rear light throws intense light directly onto the rear hitch, great for hitching your boat when the sun goes down. The redesigned cabin is two-inches wider now offering more room and the segment-first 360 camera with split-view display provides a handy bird’s-eye view, great for the worksite or simply maneuvering at the grocery store lot. The pickup truck in recent years has gone from strictly towing and hauling to more everyday-family-chariot, arguably competing with the full-size sedan segment — in Alberta, anyway. With improved road handling and comfort to larger overall cabin space with luxury appointments, the midsize truck segment is arguably redefining itself, and the all-new F-150 is certainly leading the charge. Looks: Bold, brash design with new LEDs front and back including box; colour-matched tailgate looks better without chrome plate. Interior: Cabin is two-inches wider offering more room throughout and more rear passenger legroom plus inflatable rear outboard safety belts available. Performance: 700 lbs. gone equates to better performance and torque; new 2.7L EcoBoost engine offers efficiencies; handles smooth on the highway and towing (which I did) was outstanding. Technology: Driver finds bigger 8-inch productivity screen and new 360 split-view camera handy for both site workers and suburbanites. Cargo: Lots of new features in rear cargo box including small, bright LED lights plus new stowable loading ramps for motorcycles and ATVs.